Play Solitaire; the Classic Card Game you love for your iPhone and iPad, is also known as Klondike or Patience. Play a new game every day and solve the Daily Challenge as fast as you can! Challenge yourself by smoothly move cards around the table with a drag of your finger, or tap the card you want to place, to play even faster! Challenge yourself by choosing the difficult version by drawing 3 cards easily! 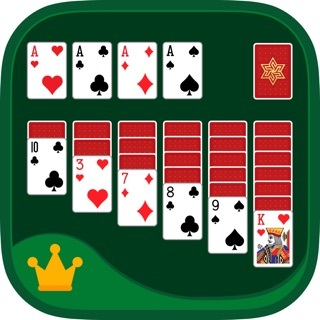 • If you want an app to play Solitaire, this is it. No frills. Just fun. • Love the deck shuffle sounds. • No complaints, attractive game and nice graphics! • A challenge which stimulates the brain cells while having fun. • Best game out there! • Easy to play. Works with or without a connection. Very reliable. • Great app. Play everyday. Awesome job!!!!! If you've ever played Solitaire or any of its variants such as Tri Peaks, FreeCell, Spider Solitaire, Blackjack, Video Poker and other poker card games, then you are going to love Solitaire! Play it now for free! Please email us at feedback@impalastudios.com with any suggestions or questions. If you are happy with this app, please let us know by rating and reviewing us in the App Store!